When Clay Jannon lands a third-shift front desk job at a strange 24-hour bookstore in San Fransisco, he doesn’t suspect that an adventure would soon unfold. Low on cash, unable to find work in web design, and discouraged by the recession, he takes what he can, even if it’s dreadfully boring. Quickly, he can’t figure how the place stays afloat, particularly since the bookstore seems to work more like an eccentric library – curious people borrowing curious books at all hours of the night. Mr. Penumbra requires little of Clay. Simply, record everything you observe in a log book. Keep the store open and help whomever comes in. Mr. Penumbra, like his patrons, is a mystifying yet simple man whose business ethic, as far as Clay can discern, is not a money-making industry. The whole thing is an enigma. So he pokes around. Clay explores the bookstore. He inquires about its patrons. With the help of a sharp, young Google employee, he starts to decipher just what in the work is going on at Mr. Penumbra’s 24-Hour Bookstore. In short, Clay becomes engrossed in a secret society of knowledge seekers, a centuries-old group of sleuths who long to decode a message from its first member. What began as a dull graveyard shift at a bookstore morphs into a literary adventure of a lifetime. This book offers an extra bonus of intrigue for those who enjoy the creation and aesthetic of typography. Part fantasy, part mystery, part comic relief, Mr. Penumbra’s 24-Hour Bookstore brings together technology and books in a creative, imaginative way. It takes readers on a thrill ride from dusty bookshelves to Google offices to an underground cave filled with cryptographers. Whether you read on a Kindle or prefer to smell the musty pages of an old library book, this is a charismatic novel written for story lovers of all kinds. 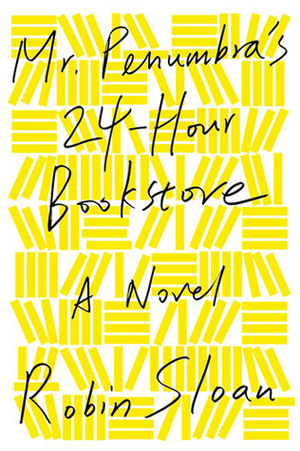 Buy Mr. Penumbra’s 24-Hour Bookstore here.